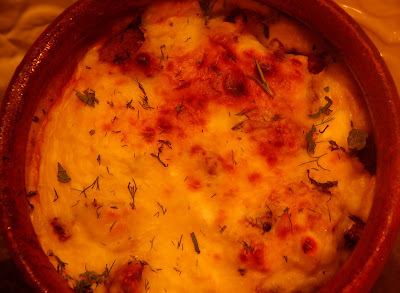 My current favourite casserole: lamb and yoghourt! I made it for The Artist’s birthday some time ago and it was such a hit, that I thought it would be a great dinner for The Lawyer and family. The Lawyer’s wife came out of hospital yesterday, but the young Scotsman still needs to grow and gain some weight. I saw photographs of him tonight. I didn’t think it was possible that a baby could be so tiny! But he came off the ventilator today and is doing just fine. I decided it was necessary to take some time out of my hectic schedule and play in the kitchen. The problem with me and cooking is that I never stick to a recipe. I believe recipes are meant to be the inspiration and from there you make a dish your own. Today I decided to make the casserole more of a meal in one and added some rice noodles. I love the richness of the lamb and the slight sourness of the yoghourt. For freshness, I added liberal amounts of chopped mint and dill. It made a wonderful supper with a crisp, leafy salad. I kinda want to cuddle up with this and a big chunk of bread and make nobody talk to me for an hour or so. Same here! That looks (and sounds) utterly delicious.